"We always thought of this as a kind of 'hippie anthem' as much as anything else - I remember driving down a street in Santa Monica on the way to the beach sometime in '66, hearing it on the radio and thinking 'we GOTTA do this tune' - we were never that great as Vandellas, as you'll hear on this version, but we liked to use it as a vehicle for stretchin' out and jammin' hard on two chords Coltrane-style, and this performance reflects some of the best of that." "It's probably well known that this song was written in the aftermath of Altamont; this version is one of the earliest, and has a much snakier groove to it than we later gave it. This isn't really 'acoustic;' Bob plays acoustic, and the rest of us are electric. This tape was found in a box of old stuff marked 'unknown' in the bowels of the vault. Who knows what else we might find in there?" "The definitive early GD jammin' tune - the first one we ever really stretched out beyond all recognition, by using what we called then 'shifting gears' - which is really nothing but a twenty minute accelerando, influenced by the North Indian music that we were listening to a lot of at that time. This version has a riff towards the middle (at about 12:20, played by me) that we later expanded and used extensively - unfortunately, none of those performances seem to have survived." "One of Pigpen's best tunes - the contrast between the straight-ahead bogaloo rhythm and a slow blues triplett groove made it really expressive, as did the lyrics 'ballin' a coal-black steel jack-hammer,' etc... (also contains a classic sample of P.A. feedback during Pig's harp lead - truly authentic)." "A tune that never made it onto an "official" album - who knows why? Maybe we just decided we didn't dig it all that much at the time (maybe we never performed it that well, either - judge for yourselves). Anyway, it's turned out to be one of the most requested (for release) tunes in our history. Go figure." "A hyperdrive version (from an audience tape) of Otis Redding's classic macho anthem distinguished by some intense jamming and a 'very' responsive crowd (I don't remember why they were so excited - maybe Pig was doing some strange dance),"
"One of my fav Bobby tunes - I always enjoyed playing this one 'cause the changes really challenged us to try different stuff - also the two-part jam at the end usually builds to a grand climax..."
"When I first met Jer, he was playing acoustic guitar and singing old folk ballads. This song, along with 'Fennario,' 'Whiskey In The Jar' and 'Matty Groves' is my all-time favorite of those that he used to do (at parties as well as gigs). The feeling in this performance is vastly different from the faster way we did it later on - it has a kind of loping, banjo-frailing groove to it that I find very appealing." "We were once accused of playing this song for 45 minutes - this version isn't quite that long, but it's the longest I could find. This was recorded at a Russian River resort ballroom on Sunday night of Labor Day weekend - I don't think there were more than 25 people there, but we played our little hearts out for them anyway. Pig does his patented 'Git your hands outta yo' pockets-git on up an' dance' rave, and the band keeps endlessly inventing new stuff behind him. We had to master this one in mono, because it was recorded with vocal mikes on one track and the whole band on the other." "One of Dylan's greatest songs, and one Jer always had a particular affinity for - I only wish we'd done it more often. I find his guitar lead on this version unutterably poignant." 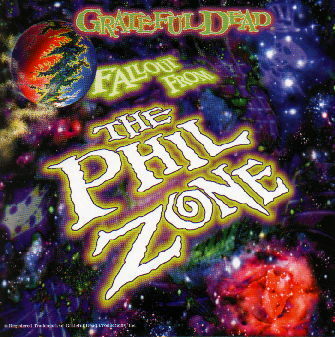 "This song means a lot to me personally, as I understand it does to many others - I've wanted to put out a live version for quite a while now, so here it is..."
Fallout From the Phil Zone was released June 17, 1997.